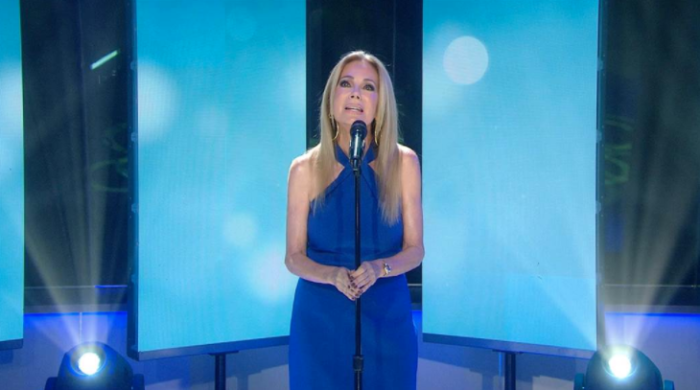 Inspired by her late husband, Frank Gifford, three-time Emmy Award-winner Kathie Lee Gifford debuted her new song, "He Saw Jesus," on Thursday's "Today" show. Gifford teamed up with country songwriter Brett James to pen the emotional tune. It was her first musical performance on the "Today" show since 2008, and the TV host left her colleagues in awe with her performance. "I hope it brings hope to people," Gifford said before performing the song. "So many people loved Frank. So many people still do. I wanted to honor his memory with it, but I also wanted it to do some good in the world," she explained. Hoda Kotb, Gifford's co-host, announced that all proceeds from the song will go to the international relief organization Samaritan's Purse. Franklin Graham, president of the Billy Graham Evangelistic Association and of Samaritan's Purse, promoted Gifford's song and praised her performance on social media. "A big thank you to my friend Kathie Lee Gifford who has just finished a new song to honor her husband, Frank Gifford, who went home to Heaven two years ago. ... She is donating all the proceeds to Samaritan's Purse. She has a great heart for helping people." Frank Gifford died at the couple's Connecticut home on Aug. 9, 2015, at age 84. "I found my husband on the floor one beautiful Sunday morning," Gifford told Kotb. "I said this was the look on his face — and I said, 'He saw Jesus, and Jesus took his breath away.'" Gifford told Grammy award-winning country musician Brett James the story earlier this year in Nashville, vowing that "'One day, someday," she would "write that song." "Brett looked at me and he goes, 'Well, let's write that song,'" Gifford revealed. He then "tricked" her into recording the song under the impression that it was only a demo for someone else to cover. "Only you can sing this record because it's about you and Frank," Kotb told Gifford. "He Saw Jesus" is available for purchase on iTunes.